Last Tuesday before bed, I laid out my clothes for the next day, including my workout clothes, as I had penciled in a workout for the next morning. When the alarm went off on Wednesday, I did not want to go! I didn’t feel good – Spring is great, and I love the highs in the 50’s that we’ve been getting, but it generally brings about some sinus congestion, and this was in full force. I didn’t sleep good – For some reason, I was tossing and turning all night. One of those nights where you’re hot under the blankets, and then cold as soon as you take one off. My sleep was off anyway – The daylight savings shift, which took away an hour, was only a few days old, and my body had not adjusted. My 4:40am alarm was only 3:40am according to my body. When the alarm went off, I was torn. I hit snooze and lay there for a couple of minutes. I got out of bed and turned the alarm off. I went into the bathroom. I turned around and went back to bed, flipping the switch for the later alarm. I lay there for another minute. Then, I got up, switched the alarm again, and actually went and got ready. I knew that backing off would be something I’d likely regret for the rest of the day, and I just couldn’t do it. I pushed on and I got to the gym. When I got to the gym, I pushed on again. I have been trying to stay consistently under a 10:00 minute per mile pace, something that I have been able to do, but the way I was feeling was definitely dragging me down. I ran the first mile at a 10:28 pace. By the time I was done with a second mile, I’d improved to about 10:15, but I still wasn’t sure I was going to make it. My goal was to do between 3.0 and 3.5 miles total, and when I got to around the three mile mark, and calculated that I was around a 10:10 pace, I decided that I was going to go for it. I started clocking up the pace 0.1 MPH every 30 seconds. I figured I’d made it this far, I’d push it until I crossed. And finally after about five more minutes, I did. As soon as I hit the pace, I bumped down to my cool down. I was exhausted. I was out of breath. But it felt awesome to push myself for a second time and break through! In the end, it not only kept me on track with my goals, it provided me with motivation for the remainder of the day. When you start your day off on that kind of note, it just sort of help guide things in the right direction. Saving – Putting money aside isn’t easy. There’s always something to buy or a bill to pay. But, if you conquer through the temptations and the other things that come up, you can find yourself with a nice chunk of change and a goal met. Work – There’s always some task or another at work that I have no interest in doing. I work as a project manager, and while overall I really enjoy the work, there are certain elements that are mundane or that I just don’t enjoy. I’m sure every job has that. Pushing through those allows you to cross them off the list and concentrate on the aspects that are most enjoyable to you. When it’s all said and done, letting something stand in the way of a goal is often very tempting, and there are times when it’s very easy to just let go. However, when you push through that and make yourself follow your goals, the end result is often fantastic. Readers, tell me about a time that you’ve nearly given up on something and ended up coming through to meet your goal, or about a time that you regretted hitting that snooze button or something otherwise. This happens to me every morning when I run. During my 6a runs I’m always like “This feels great, this is easy!” but whenever my alarm actually goes off that early I’m like “Uuuuuggggghhhhhh”. It always feels great to actually get the run over with but boy it really is tough to get out of bed sometimes. 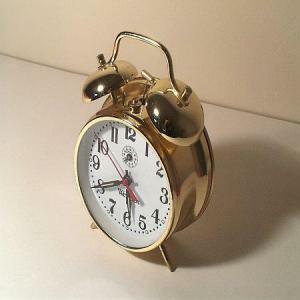 Getting past that pesky alarm clock seems to be the challenge to so many things in life. They really should outlaw those things!